Views were used on more than 80% of all Drupal 7 sites; now they are part of the Drupal 8 core. While most site builders and site owners are aware of views, they don't understand how to take full advantage of their power to create many amazing pages and blocks. If they use views, they might build 10 different view displays with different filters, without knowing that a contextual filter would require only a single display. Using our sample company, we'll take its existing content and evolve an ever more complex and powerful website for that company, starting with adapting the administration the user sees and moving on to making complex pages of information for site visitors. 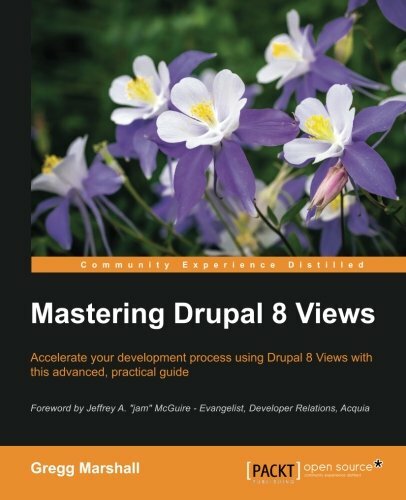 While the book is written for Drupal 8, the similarities between Views in Drupal 7 and 8 make this a useful reference for Drupal 7 site builders also. Gregg Marshall has been using Drupal since 2006. While he installed Drupal 5, his first production site was Drupal 6. He started his career as a software engineer, switched to sales/marketing in an unrelated industry, and drifted back to development. After attending DrupalCon 2010 in San Francisco, Gregg switched from channel marketing that used Drupal for microsites to being a full-time Drupal developer. Gregg works as a consultant/contractor, frequently mentoring in-house development teams on Drupal best practices. His current contract is with WebNY, where he serves as the senior Drupal architect for the state of New York, helping build a single platform for all the state's websites. Gregg is a speaker at Drupal Camps and is a professional speaker to 30+ associations and corporate meetings. He has over 400 published articles in a variety of publications. Gregg has a bachelor's degree in chemistry, a master's degree in electrical engineering, and a master's degree in business administration. He is an Acquia Certified Drupal Grand Master.